It looks like the Bulls are better than the Lakers, which would have been a good thing in 1987 or before the start of this season. “We have a good team,” said Bulls coach Tom Thibodeau after a fun night at the United Center with a howling, stomping, dancing crowd that enjoyed more than a 95-83 win over Kobe, Dwight, Pau, Nash and the Lakers. The Bulls — still without Derrick Rose and also Luol Deng, and after losing a 14-point lead and seeing the game tied with 7:26 — left pulling away on the play of Marco Belinelli, Jimmy Butler and Kirk Hinrich, were cause for celebration. It is getting tougher and tougher to deny, and with the Bulls tied for third fewest losses in the East, now 24-16 and with Thibodeau saying Rose is closing in on joining the team in full practices, the possibilities begin to get a bit more delicious as the team hits the midpoint of the season and All-Star bids for reserves Thursday. And, indeed, it was a big win as poor as the Lakers record is, now 17-24 and 5-14 on the road for a solid 12th in the West. Though four games out of the eighth spot in the West — and what chance would they have to beat the Thunder, anyway — the Lakers probably need 30 wins in their last 40 games in the tough Western Conference to get that final playoff spot. Yes, it will be tough to happen. It’s not a good idea to read psychology and concurrence into a post game interview, but Bryant has been as quiescent under the circumstances as I’ve seen him during his amazingly competitive career. Which is hardly to mean Bryant accepts losing. But my sense is he seems to understand this thing has gone way off the tracks and there’s no fixing it now, hardly by him as he felt behind Kevin Durant to second in the league in scoring. Bryant said all the right things about having to make changes, being concerned, though in talking about needing to return to more post play stepped into the division existing on the team as coach Mike D’Antoni mostly disdains post play, which, of course doesn’t go all that well with his post players, Howard and Gasol. Listening to the trio late at night as the NBA wrapped up its great Martin Luther King Day of games, the other great NBA regular season day of the year along with Christmas, not that they were demanding another coaching change, but divergent tenets are on display among very strong, independent, stubborn and mostly successful men. It’s a difficult blend. Gasol said he wasn’t thrilled about going to the bench, though the way D’Antoni has coached for decades he hasn’t used one post man, let alone two. Typical of the salutary Gasol he said he didn’t want to put himself before the team and wanted to remain a Laker. It seems inconceivable both Howard and Gasol could stay, and certainly one has to be traded if the Lakers are to have any semblance of a team under D’Antoni. Bryant suggesting changes to post play and half court acknowledges his apparent belief the Lakers erred in not hiring Phil Jackson. For all Jackson did for the Lakers — yes, he was well compensated — they did back out of several apparent promises, including some form of post coaching advising/mentoring position that Jackson could now get if the Kings move to Seattle as he’s close with that new ownership group. Howard, likewise, was repeating quietly and hardly seeming to have any fun that the team had to play inside/out. Yes, like in Orlando. The grass isn’t always greener even if it is a mild climate. It’s not that acknowledged, but the Lakers went to Jackson on the suggestion of Howard’s “people,” whomever they may be. The Lakers had distanced themselves from Jackson because they didn’t believe he wanted to coach, and probably wouldn’t have had a change of heart to try if not for Howard’s suggestion. Though there are conflicting reports of what exactly happened, it is clear patriarch Jerry Buss overruled his management and rejected Jackson’s third return. It doomed this Lakers’ group, and probably D’Antoni as well as the roster was so ill suited as a slow, aging team for his dynamic style of play. The said they wanted to bring back Showtime, but they forgot to get Magic and Worthy. Howard, separately, spent time talking with Thibodeau and you got the sense both imagined what it might be like with a coach who is half court, post oriented. And perhaps Thibs dreamed some as he really doesn’t have a post player anywhere near the skill level of Gasol or Howard. And there were some very animated, and not looking so happy, conversations on the Lakers bench between Bryant and Howard, especially after Howard a few times had turned to go to the basket and got hit in the back with a Bryant pass. Howard had five shots in just under 30 minutes. He used to dunk five times on Noah in the first two a half minutes in Orlando. “Look at the stat sheet,” Howard kept mumbling, though I couldn’t hear all the questions. He wasn’t smiling. The way D’Antoni plays, it probably would be best to trade Howard. Though the Lakers probably have to try to resign him given Gasol will be 33 this summer and has been getting hurt. Oh, do we love to talk about the Lakers. But this was a Bulls night, and oh what a night it really was given coming off the Memphis loss, Deng out and Thibodeau in several rotations playing lineups I’ve never seen that included no starters and Nazr Mohammed, Robinson, Taj Gibson, Belinelli and Daequan Cook. It’s a frequent refrain from Thibodeau, and one that usually gets the eyes rolling. But it’s becoming more difficult to not take seriously as he keeps putting these minimum free agents up against Hall of Famers and… winning. The Bulls got off to a 27-20 start with eight points from Hamilton, who just delights in playing his old AAU teammates from back in Philadelphia, Bryant, and six from Carlos Boozer. It wasn’t a great game for Boozer, who did score late, but was thwarted and stripped several times by Howard and Ron Artest as the Lakers are hardly horrible. 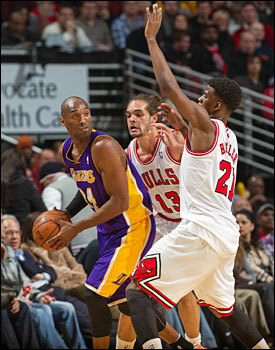 The Lakers did outrebound the Bulls by 10 and shot 23 free throws to 12 for the Bulls. 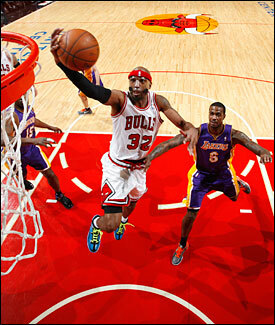 Boozer had 14 points and six rebounds as he was named Eastern Conference player of the week Monday. Yes, best in the East! OK, enough with the amnesty emails for a few days? And then there was seven from Hinrich as he absolutely dominated Nash. 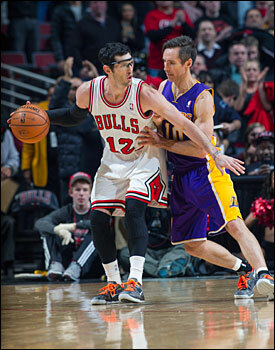 It was more in the basket this time as the Bulls hit nine of 17 threes, three each by Hinrich, Belinelli and Robinson. The Bulls kept control of the game, going ahead 47-40 at halftime. Nothing special, just running their offense, floppy, as they’re called, catch and shoot over screen for Hamilton and Belinelli, late post ups, ball movement, endless pick and rolls. The Bulls had 10 fast break points to seven for the Lakers as neither team runs much, and though new starter Earl Clark had 12 points, he’s hardly the floor spacer D’Antoni requires. Robinson did have a pair of threes in the second and flew around the court, but the defense remained good and Thibodeau remained mostly pleased. You do shake your head watching all that Lakers’ talent and not seeing the offense enough, though they are fourth in the league in scoring. But it came in the third with Bryant pushing his way in, though having to serve up seven shots. But the Lakers began to, also, even as Noah worked relentlessly, fronting Howard to prevent post catches and trying to stay out of foul trouble. Still, the Lakers took their first lead late in the third, were tied at 69 after three and you figured here it was coming, Kobe and Dwight and Pau with 7:26 left and the game tied at 75. But there was Belinelli putting the ball down hard and driving, getting a pair of free throws, Gasol missing and then turning the ball over, Hinrich with a big defensive rebound again and pulling up with a 20 footer, Bryant missing, Butler hitting a catch and shoot and after Nash and Clark scoring, Belinelli, a bit of the actor, posing as he hit a three and then Noah taking the ball away from Artest and finding Belinelli again for another three and 89-79 lead with just over two minutes left. And you’d seen enough of these Lakers you knew they couldn’t score 10 points in five minutes. Indeed, as the Bulls had their largest margin of victory over the Lakers in 10 years. Yes, these Bulls. “Every time the Lakers come to town it’s a big game, a lot of electricity in the building,” said Noah. “To come and win that way showed a lot of heart. Sometimes you get caught up in yourself, but what we try to do is a five-man rotation. Everyone has to play well. I’m happy for Kirk. I know how hard he’s worked. Jimmy Boy was huge. It makes us tougher to know we have guys like that we can rely on.